Every year, out of the 305 million annual visitors to national parks, the US sees an average of 160 of those visitors die. The national parks use their Search and Rescue teams on thousands of missions every year, attempting to give aid to lost hikers, injured climbers, and a slew of other visitors entangled in various life-threatening incidents. Many deaths can be attributed to a lack of preparation. People do not pack the correct gear or tools and lack the knowledge or experience of what gear to bring. People often find themselves lost and trapped against the elements. If people do survive, there are often consequences to their health. One solution, to keep yourself from becoming a statistic, is to be prepared and always carry, as well as have the knowledge in how to use, appropriate survival gear and tools on all trips to the great outdoors. These days, survival gear comes in a variety of designs that are both high and low tech. The best survival gear and tools will have one feature in common across all designs: practicality for wilderness survival. When time is of the essence and life may be on the line, it is critical to be prepared for any emergency. There are survival kits full of the best survival gear and tools that are essential to any outdoor excursion. Our list of the 12 Best Survival Gear and Tools in 2018 breaks down the best designs you should add to your camping checklist because they may end up saving your life. One of the first survival gear items that may come to mind is a first aid kit. First aid kits can save lives in the wilderness and are a great item to add to your pack. 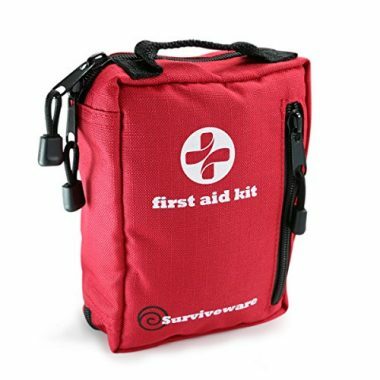 This Small First Aid Kit by Surviveware comes in a compact, portable, and durable bag that can be easily taken on any outdoor adventure. This kit comes in a 600D polyester bag, which gives the contents water resistance. The kit includes 100 basic life-saving items, and all are organized with labels. Organization is key in times of crisis and this kit ensures that you won’t be frustrated when trying to find an item. The inner sleeves are labeled according to their function and there is a separate zipper pouch for personal prescription medications. The best survival gear ensures you are prepared and with this first aid kit, you will have access to all the basic necessities. Surviveware has made their pack MOLLE compatible, so you can easily attach it to a bag or belt. This first aid kit is perfect for any outdoor adventure and can be used in the school, home, or office too. On top of your purchase, Surviveware wants to keep their customer satisfaction at 100%. Surviveware includes their Money Back Guarantee and Lifetime Warranty. During your time of need, this kit will be there to provide lifesaving support! If you would like to bring technology into the great outdoors, these GPS devices can track your location and have you talking with friends while on your adventure. goTenna has designed a device that connects with your phone and tracks your location and allows you to follow your messages. A great feature about goTenna’s devices are that you don’t need a network tower, router, or phone service for them to work. These devices are independent and free, giving you more freedom in the great outdoors. With goTenna Mesh you can chat one on one, in a group, or receive emergency broadcasts. You can access free and offline maps with the goTenna app. 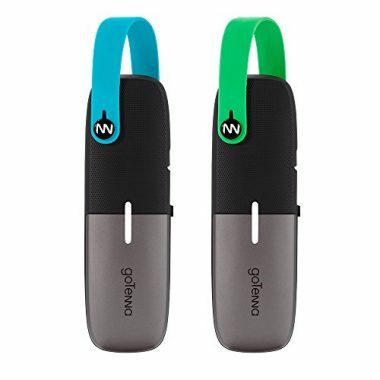 goTenna Mesh devices are an excellent choice if you are going out of the range of cell service, travelling internationally, or find yourself in an emergency situation. All you need is to have the goTenna app on your cell phone and then connect the devices. There is no screen on the goTenna Mesh device, so all information will be sent to your cell phone. goTenna has ensured that their devices are compatible for both Android and iOS (Apple). The apps can be easily accessed and downloaded in the devices respective store. goTenna Mesh are sold in pairs and the charging cables are included. 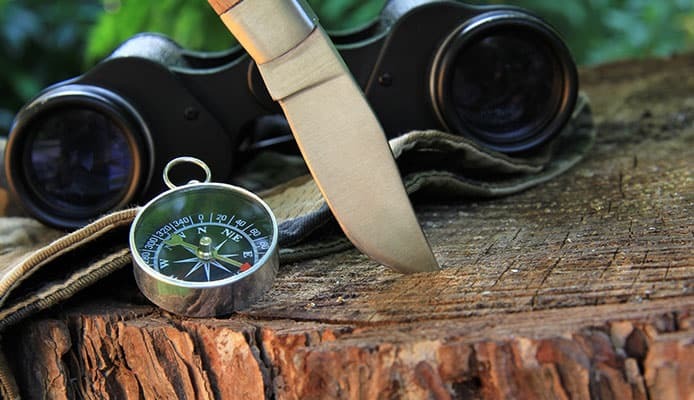 These top rated survival tools work in a 4 mile radius of each other, which means you can adventure solo for a short time, but stay connect with your buddies. With goTenna Mesh you will be comforted knowing that you are connected with your group members and won’t be lost in the wilderness. If you want a GPS device that does not need to connect with your phone and has a screen of its own, this design by Garmin is an excellent choice. The inReach Explorer+ GPS Navigation by Garmin features 100% global iridium satellite, which allows for two-way conversation between devices. 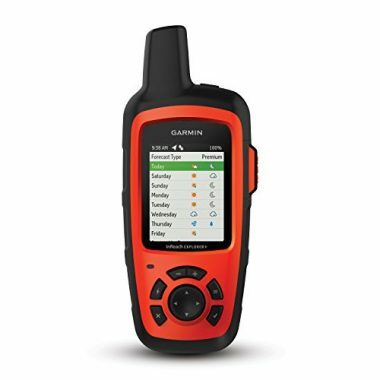 With a satellite subscription service, you can use this Garmin GPS device for the SOS system and 24/7 Search and Rescue monitoring center. You can track and share your location with family and friends, ensuring the proper authorities will be notified in case of an emergency. The inReach Explorer+ GPS Navigation device is waterproof to IPX7 and is recharged with a lithium ion battery. If you would like to pair the device with a cell phone, you can then access and download US NOAA charts, color aerial images, and more. If you don’t want to use your cell phone, the inReach Explorer+ device has preloaded DeLorme TOPO maps and GPS routing. On your screen there are features like a built-in digital compass, barometric altimeter, and accelerometer. You are guaranteed to be safe on your journey, so you can adventure with ease. With the Garmin inReach, you can explore anywhere but communicate everywhere. Water is a source of life for all living things. Access to fresh water is of the utmost importance in a survival situation. To survive, you need to ensure that you always have a source and access to clean drinking water. The LifeStraw Personal Water Filter by LifeStraw is the ultimate survival gear necessity. The straw will give you access to clean water and filter it as you drink. 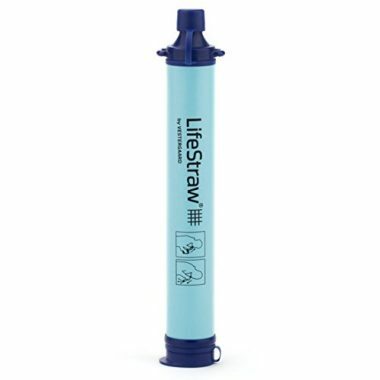 The LifeStraw Personal Water Filter by LifeStraw removes bacteria and parasites from water up to 99.99%. This microfiltration membrane can remove bacteria like E. coli, salmonella, giardia, and cryptosporidium. The LifeStraw also removes microplastics, which can be harmful to the body. The LifeStraw has been rigorously tested in laboratories to standard testing protocols, ensuring this is a safe water purification system. This LifeStraw will provide 1,000 gallons of filtered and safe drinking water with proper use and maintenance. The average person drink less than 1,000 gallons per year, so this personal water filter is guaranteed to be long lasting! The LifeStraw is portable and easy to use. With this design, you can drink directly from water sources like lakes, streams, and rivers. The LifeStraw is compact and weighs only 2 ounces. You can easily travel the world with confidence! As well, LifeStraw if committed to making an impact in the world. To achieve this, every purchase of a LifeStraw provides a child in need with clean drinking water for an entire school year! There are a lot of different outdoor emergency tools and it can be overwhelming choosing and packing all your survival items. If you are looking for a survival pack that includes a variety of lifesaving tools, this Survival Kit Outdoor Emergency Gear by EMDMAK can help save your life in a bad situation. These top rated survival tools come in one handy pack with a compact design. The tools come in a 6 in 1 waterproof case, which ensures that your tools won’t be damaged if dropped in water. The case is closed with a zipper and is also shock resistant. This survival kit is practical and durable. Some of the items included in this pack are a fire starter, emergency whistle, multifunctional pliers, and an emergency blanket. All of the tools in this kit can come in handy. You can cut through rope or small branches, unscrew screws, open cans, and repair items. There is a flashlight included in the multifunction pliers as well, ensuring you won’t ever be stranded in the dark. 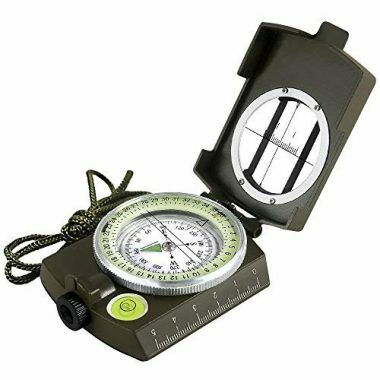 There is also a compass included, which can help guide your way on the trails. 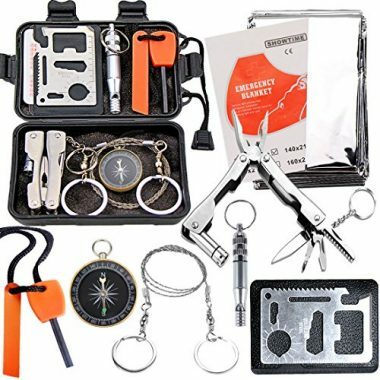 This top rated survival tools pack has everything you need and can be easily taken on a variety of outdoor adventures. If you are hiking, camping, hunting, or climbing, you can be sure this pack can be easily added to your pack and carried with you. With this kit, you don’t have to carry a variety of individual items and struggle to pack and locate them in your pack. Instead, you can carry multiple designs together and feel secure you are prepared for your wilderness adventure! Not every outdoor adventure will be planned to be a night out under the stars. Many people enjoy going for day hikes. However, you should always be prepared to spend the night out no matter your excursion plans. Things don’t always go according to plan and a day hike could turn into an overnight emergency situation. To be prepared for an event like this, the Emergency Survival Shelter Tent by SharpSurvival will provide a safe and temporary shelter. Exposure can kill and people who aren’t prepared to protect themselves against the weather put themselves at risk. This tent is made of mylar thermal material, which is waterproof and windproof. The tent will reflect 90% of body heat inside its structure, ensuring that you stay warm. The tent is compact, lightweight, and reusable. It is easily set up in minutes. All you need is to string a rope between two sturdy objects and attach the tent to the rope. The tent is spacious and can provide protection for two adults. Shelter is important to an emergency survival situation and this tent by SharpSurvival brings relief and eliminates the worry of building a temporary structure out of branches. You can also use the tent body as an emergency blanket. You should always be prepared for the worst and unpredictable events. This tent will save you during bad weather and cold nights. 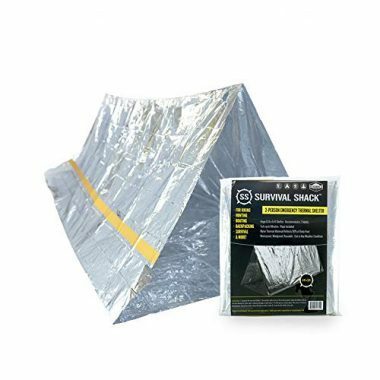 Easily carry shelter with you on every outdoor adventure with this top rated survival tool. In an emergency situation, maintaining your body heat is extremely important. Cold weather can weaken your body and diminish your chances of survival. To combat the cold and minimize your risk, carrying adding an emergency blanket to your survival gear pack is an excellent idea. 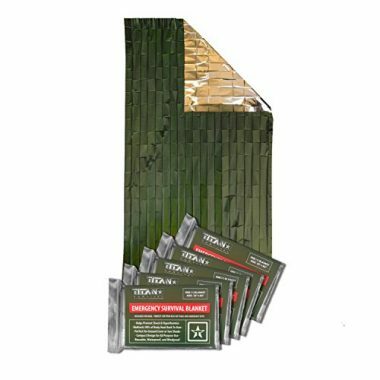 This Two-Sided Mylar Emergency Survival Space Blanket by Titan Paracord is a blanket made of mylar, which retains up to 90% of the user’s body heat. The blanket was originally designed for space exploration but is now common in survival gear and tools. The blanket is waterproof and windproof, which means it can be used on the ground, to cover your body, protection from the elements, and as a distress beacon. The blanket can help prevent hypothermia, which gives you a better chance at survival. The blanket is 52 inches by 82 inches and can be easily wrapped and folded for storage. Titan’s design is always innovating and provides you with high-quality protection. This blanket is excellent for use when camping, hiking, boating, hunting, or any outdoor adventure. The superior quality ensures superior performance, allowing you to adventure with ease. Titan includes their Titan Promise, which is a Lifetime Guarantee for their products. Titan strives for happy customers, no questions asked. A fire is an important survival tool if you find yourself in an emergency situation. Fire can be a heat source, disinfect food and water, as well as keep animals away. A fire starter is an important survival item. This Bear Grylls Fire Starter by Gerber Blades features a ferrocerium rod and metal striker. This compact fire starter will spark for 8000+ strikes, ensuring it is long-lasting and reliable. The design is watertight to keep tinder safe and dry. The fire starter can be easily carried because of this small size and won’t be lost. It is carried by the integrated lanyard cord, which also features an emergency whistle in the design. This fire starter can be used in land and air rescues, as well as call an SOS audible signal. Survival gear reviews state this is one of “Bear’s survival essentials”. You can learn more about survival with the included, Priorities of Survival pocket guide, which gives you tips and hints on how to use the fire starter. 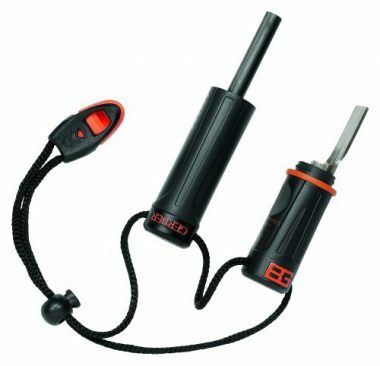 It is important to always have a fire source ready and this Bear Grylls Fire Starter delivers a high-quality design that you can easily rely on. Survival equipment comes in many different forms, but a flashlight is essential. 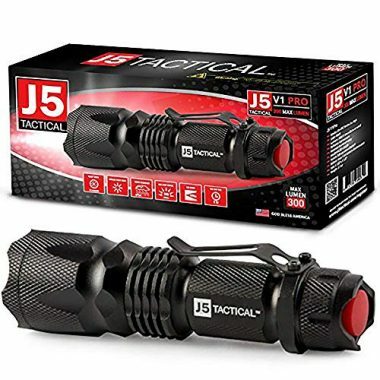 This Tactical Flashlight by J5 Tactical is an excellent choice for a durable light source. This tactical flashlight is stadium bright. It can flood an entire room or light up a point 600 feet away. The light is 10 times brighter than an incandescent light because it is an LED. There are three powerful modes, which will have you cycling through different light beams in micro-seconds. As well, this tactical flashlight is built with defense in mind. This flashlight is better with defense than keys, brass knuckles, or batons. With minimal force swing, you an easily protect yourself. This tactical flashlight should be at the top of your survival tools list because it is extremely durable. You can put this flashlight in the freezer or run it over with a truck and it will still work and provide waterproof protection. The tactical flashlight is guaranteed to work in Mother Nature’s worst temper from downpours to blizzards. This tactical flashlight is also an excellent choice for the armed forces, police officers, and security officers. This tactical flashlight runs of an AA battery and can be used in the home, office, or field. You will always have a reliable light source with J5 Tactical’s design. To ensure you love your new flashlight, J5 Tactical has included their 100% Satisfaction Guarantee. If you are unsatisfied you can ask for a refund or exchange with no questions asked. A compass should also be included in your survival pack. If you ever find yourself lost in the wilderness, knowing which direction you are going could save your life. This Multifunctional Military Aluminum Alloy Compass by Eyeskey delivers a professional grade survival tool for everyday situations. Whether you are camping, hiking, or backpacking, you will be prepared for any emergency situation with this top rated survival tool. This compass features a floating dial with a 360-degree scale. The body is made of aluminum allow, which is durable and long-lasting. The compass is a professional-grade lensatic design that is extremely lightweight and conveniently folds into a compact size. The compass is military grade, which means that it features an “Under Control Tactical” design. This design is full-featured and will provide year of serious use, even under extreme conditions. The compass ensures that you won’t be lost, even if you are relying on technology. You don’t need any cell phone, batteries, or other electronic devices for this compass to function. It is a great design for any outdoor adventure. You can take this compass motoring, boating, hiking, camping, and many other places in the great outdoors. With Eyeskey’s design, you will be certain this compass is a trusted friend that can point you in the right direction. An emergency signal can save your life. One survival item that could save your life is a survival whistle. 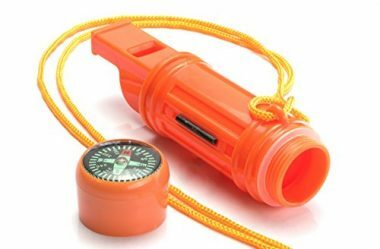 This Survival Whistle by SE features a bright orange design and water-resistant container. You can use this whistle to send out an audible SOS signal, as well as use a signaling mirror, or light a fire. The whistle is made of heavy-duty plastic and features a built-in lanyard. The whistle is lightweight and compact. It can be used in any outdoor excursion from fishing to hiking. If you happen to get lost, there is also a compass in the design to help you navigate your way. An emergency light source should be added to your survival pack. You don’t want to always be reliant on batteries and charges and being prepared for every situation can save lives. These Ultra Bright Glow Sticks by Glow Mind are a long-lasting emergency light source. These glow sticks can last for more than 12 hours and deliver a bright light. They have a 4-year shelf life, which means that they will always be ready to crack and use. 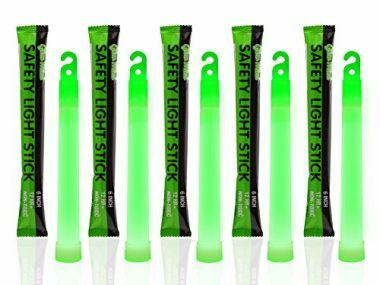 These glow sticks are safe to use because they are waterproof, non-toxic, and non-flammable. These glow sticks are individually wrapped in foil to prevent damage and breakable. With Glow Mind’s 100% Money Back Guarantee, you will be certain to love these glow sticks, or you get your money back! Travel with less stress and invest in the best glow stick design offered. All camping tips and techniques will tell you that survival gear is extremely important for any outdoor lover. When you are deciding which survival gear and tools are the best to buy, it is important to consider what you are doing, where you are going, and how long you will be gone. There are many different designs of survival gear and tools that can help in specific situations. 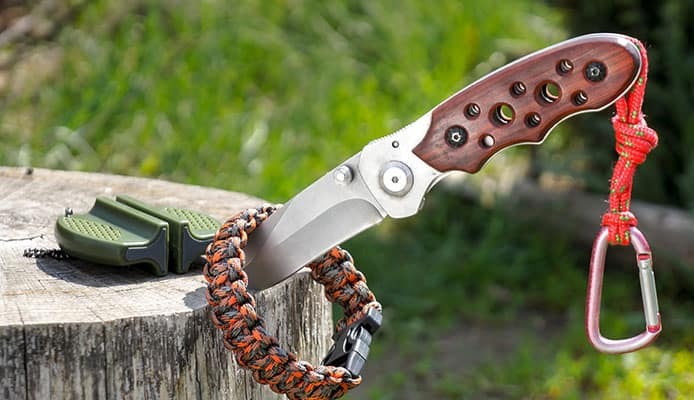 From survival lighters to paracord survival bracelets, survival gear and tools are meant to help you live in an emergency situation when you are waiting for assistance. You want to invest and choose the best quality survival gear and tools. Space is limited in your pack and carrying something that you don’t need could be a costly mistake. Survival gear and tools that are high-quality may have better characteristics of their designs that can assist you in getting out of danger. Here, we have a guide of some elements of survival gear and tools that you should seriously consider before making a purchase. How you choose your survival gear and tools can mean life or death in the worst situations. With our guide, you will have the confidence to choose the best survival gear and tools for you. This is a broad category because there are many different designs in survival gear and certain designs achieve specific tasks. There is also a large variety in tool designs. Generally, the top three essentials for surviving are a water filter, compass, and flashlight. Depending on where you are and what you are doing, other survival gear like a knife, Firestarter, GPS device, blanket, tent, and rope may greatly come to your aid. As well, there is specific survival gear or tools for different outdoor activities. If you are going out on the water, there may be different gear that would better suit your needs when compared to a person who is staying in backcountry. It is important that you consider what activity you will be partaking in, when it comes to deciding which survival gear or tools to bring along. You want your survival gear or tools to be optimized for the environment you will be exploring, which will give you the best chances of survival. However, it is important to remember that you should center your survival gear and tools around a few essentials. Shelter, water, warmth, and a beacon system are all important and may help Search and Rescue teams locate you easier and faster. Consider centering your survival pack around those essentials and expand from there depending on your specific activity. When it comes to survival gear and tools, like the type, use will be a broad category and be heavily reliant on the design. There are many different designs for survival gear and tools, because there are many different types from emergency radios to personal locator beacons and flashlights. A hint to start may be to find a camping first aid checklist to help you decide what’s important when it comes to choosing any survival gear or tools. What’s important is that the design is easy to use and understand. Some survival gear and tools may have design specific knowledge that you need to learn, but once you have used the gear or tool, you should be able to easily and confidently use the device in the wilderness. As well, it is important to consider what the survival gear or tool is and where you are going. If you will be in the snow, the gear and tools that are best for snow may different from those that would be used in a desert setting. Certain gear and tools may not be able to withstand specific outdoor elements, so it’s best to review the design and manufacturer’s information to be certain you are selecting the best device. Size and weight will also be a broad category because, again, it is based on the specific device’s type and design. There are many different size and weights of survival gear and tools, but the most important aspect is that it can be easily carried. You want your survival gear to be sturdy enough to do the job, but not be too heavy to weigh you down. As well, because of the variety in gear and tool designs, the size and weight may drastically differ. There are many different gear and tools that are within the same device category that will have a different size and weight based on their design. An example of a survival tool that has many different designs that each have their own size and weight is a water filter. There are many different water filtration devices and systems that can save your life in a survival situation. Some systems are pumps and other are personal devices, like a straw. These different designs will all have different sizes and weights based on the device. If you are looking to be compact and portable, a water filter straw may be the best design for you. This is key to deciding which survival gear and tools should be added to your pack. You do not want to pack unnecessary items and weigh yourself down. You should feel confident that you have the sufficient gear and tools to survive in a worst-case scenario but review your itinerary and really narrow down your activities. This can help you cut the weight of your pack. All survival gear and tools should be practical for your projected itinerary. Bringing a tool that is best used in a winter landscape, won’t be useful if you are out hiking in the desert. You may think that you need a multi-tool so that you can open cans, but realistically you may be able to survive without using every tool on the device. It is then best that you find a minimal design that can still achieve what you want but aid you in survival if need be. Remember, that the longer you are out in the wilderness, the more grateful you will be to carry only what is needed and not any extra gear. The durability of your survival gear and tools is extremely important because it can mean life or death. If survival gear or tools fail because they broke during use on your adventure, it can add stress to an already stressful situation. You want to be sure that the survival gear and tools you choose, won’t break on the job. Often many people encounter problems with survival gear and tool’s durability when they are trying to downsize or minimize the items and weight of their pack. One scenario is that people choose to downsize and combine multiple pieces of gear and tools into one design like a multi-tool. While multi-tools can be a great choice, make sure that the device is durable enough to handle the variety of tasks. You shouldn’t settle for low-quality or cheap survival tools. Tools that are low-quality are most likely going to fail because they are poorly manufactured and made of weak materials. You should be confident that you can use and rely on your tools in a survival situation. The last thing you want to do is stress over a broken device. When it comes to emergencies that can mean life or death, it’s best to invest in the highest quality possible. On the flip side, versatility can help you successfully minimize your pack and combine survival gear and tool designs into one device. Some high-quality survival gear and tool designs can do that job of three items in one. These devices should be easily switched to accommodate a feature of the one design to then execute a different task. Finding survival gear and tools that can be used for more than one purpose is certainly helpful for the weight of your pack. Instead of carrying several different items, you may be able to find a design that incorporates all the functions you need, into one item. Versatility is a great option, but you should still consider the durability of the survival gear and tools. You don’t want to be combining certain designs and then have them fail in the field. It’s best to look for the high quality survival gear and tools to ensure that they are versatile, but still function and perform their task. Q: What is the best way to store survival gear? A: This will heavily depend on the type of gear or tool and its design. Many manufacturers should include, with their product, a guide or manual. The guide or manual should have suggestions for storing the product when it is not in use. Generally, all survival gear and tools should be stored in a dry location. Water, humidity, or even a little moisture can quickly hinder even the highest quality survival gear and tools. Water damage can lead to mold and rot, which will make your survival gear ineffective for use in the wilderness. Also, remember that many manufacturer’s will include cleaning instructions for their products. Some survival gear and tools may never need cleaning and others may require frequent maintenance. After all cleanings, survival gear and tools should be dried and properly stored. Survival gear and tools that have been take care of and properly stored are guaranteed to have a longer life. As well, proper storage of your survival gear and tools ensures that they are always in top shape for every excursion. You wouldn’t want to risk your life and carry ineffective gear, so proper storage is a must. Q: What is the best way to organize survival gear? A: There are a few guidelines which can be used to help you organize your gear, but it will ultimately be decided by personal preference. The two main times you will need your gear organized is when it is stored and not in use or when it is being packed for a trip and will be used. You will want your gear to be organized both when it is packed in a bag and when it is being stored. Organization of your gear and tools can keep you from being frustrated and get you out on the road faster. Organizing your gear when it is being stored is a highly personal preference. Some people may prefer to organize their survival gear and tools by the type, others by the activity, and some by categories. You may choose to keep all your knives together because they are all one type of survival gear. Others will keep their gear separate by activities if they partake in a variety of them. For example, keeping climbing gear with water sports, may not make much sense. Others will break down the category of their pack such as clothes, kitchen, and tent. It is all up to you how to organize your gear in storage. Organizing your gear for your trip and packing your gear may be vastly different than the organization you keep when storing your gear. Some people have a vast collection of survival gear and tools, which means taking everything they own on one trip may be impractical or impossible. When organizing and packing your gear for a trip, remember that you will want to keep it handy at all times. In a bad situation, having to unpack all your things can only add stress and frustration. Keeping survival gear in outer pockets or on your person will guarantee quick and easy access. Q: What is the best way to carry survival gear? A: There are some guidelines that are the general rule of thumb, which can help you pack your bags in the most efficient way. The best way to carry survival gear and tools is to place the heaviest items in the center of the pack. Items such as heavy food or gas canisters, can be easily wrapped in your clothing and tucked into the center. Your tent should be stored for easy access. Depending, some people will put theirs inside the pack and others will lash it to the outside. Your sleeping bag should be carried at the bottom of your pack. For smaller survival gear and tools, they can be stored in the outer pockets for quick and easy access. However, remember that some items, such as knives, should be stored on your person in case you ever lose your pack. One system that you may want to invest in to carry your gear is a MOLLE pack. MOLLE packs is a survival gear system that was designed by the armed forces for their combat troops to carry their gear. The MOLLE system uses a vest that has rows of nylon webbing. The vest can be worn under a backpack and the gear is organized in a modular fashion. There are MOLLE compatible accessories and pouches, which can be attached to the vest to easily carry your gear. This system is a great way to fit all your gear in an organized fashion. If you are struggling to organize your gear, try using the MOLLE system as a guideline. Most worst-case scenario and survival situations are made worse by the fact that people fail to carry the proper gear or lack the knowledge on how to use their gear. Being prepared for your trip is your responsibility. Every second counts in a survival situation and carrying the best survival gear and tools, as well as having it organized, can help save lives. Poor preparation can lead to causalities. With the best survival gear and tools, you should feel prepared for any scenario and feel confident that you could survive, if needed. 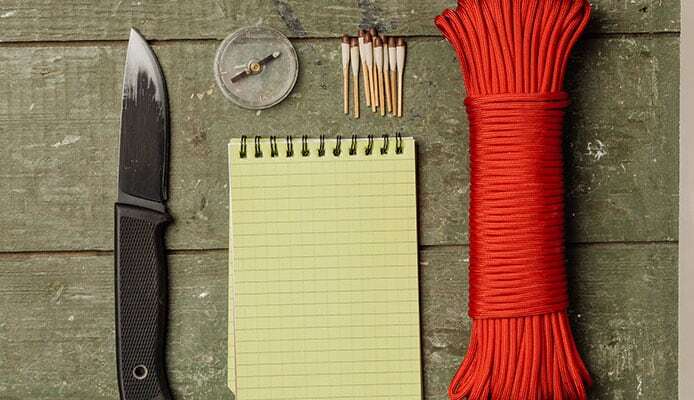 Do you own one of the survival gear or tools that made it onto our list? Let us know how it has worked for your outdoor needs in the comments section below.